This is very interesting and I really look forward to this. The Mexican government together with GeSI is convening a meeting the 8-9th of November 2010 in Guadalajara to explore how transformative low-carbon solutions can be supported in the global climate solutions. The host is the Government of Jalisco. 2. It is time to encourage more public private partnerships, and bring in the views of industry and various sectors and companies that can provide solutions to climate change, and not only focus on those with big emissions. The ICT sector already delivers many solutions that help to significantly reduce emissions with 90% or more and that can contribute to a low-carbon economy. 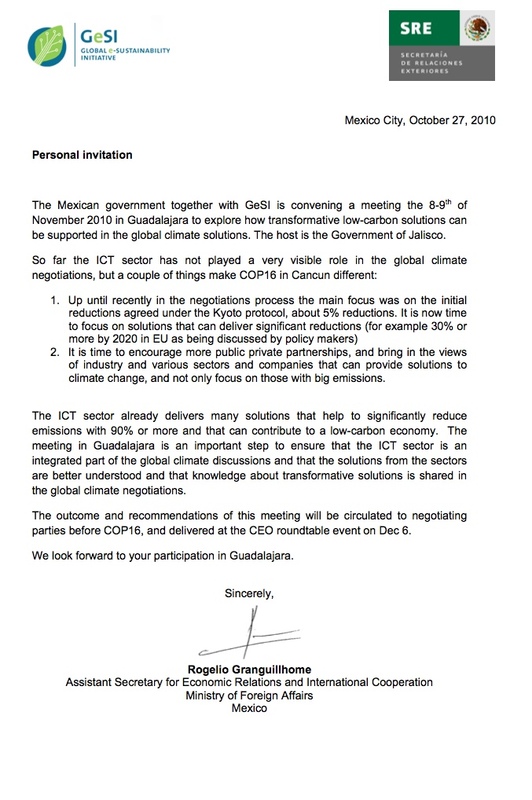 The meeting in Guadalajara is an important step to ensure that the ICT sector is an integrated part of the global climate discussions and that the solutions from the sectors are better understood and that knowledge about transformative solutions is shared in the global climate negotiations. The outcome and recommendations of this meeting will be circulated to negotiating parties before COP16, and delivered at the CEO roundtable event on Dec 6.